The news over the last week has been hard to ignore. A powerful man has been dominating the headlines for his misconduct against women. Over the past day the words "me too" have been trending. 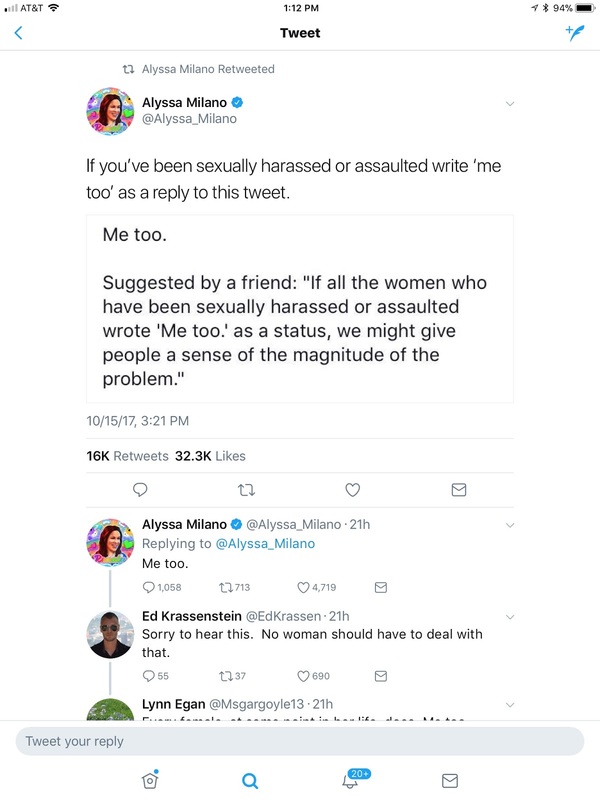 The actress, Alyssa Milano, tweeted out yesterday encouraging people to post "me too" if they have been a victim of sexual harassment and assault in an effort to shine a light on how prevalent it is in our society. 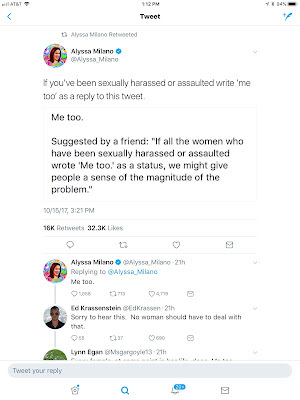 I'm going to jump on this bandwagon and say #MeToo. In 2004 I was 23 and working for CPS in a small county about 30 minutes from where I lived. This particular day I had a court hearing. I had recommended the parental rights of one of my clients be terminated. I was sitting in the judge's chambers with the District Attorney, my client's attorney, the Assistant District Attorney and the children's attorney. We were all discussing what led to my decision and the ADA and children's attorney were explaining why they supported my recommendation. It was a normal, routine hearing. We would meet in the judge's chambers a lot to have hearings. Nothing was out of the ordinary for me. During the course of discussion my client's attorney looked at me and said "If you will go to the side of the building and get naked with me we can settle this matter now and I won't fight it." I was mortified. The judge was laughing. The other people in the room were just sitting there in silence. I didn't know what to say. I was so helpless, embarrassed and uncomfortable that I wanted to crawl out of the room, but I couldn't. The judge continued to laugh. Then, after what felt like hours, but I'm sure was just seconds, the children's attorney (who was the only other female in the room), spoke up and ripped into the attorney and told him how inappropriate he was. He stood his ground and said it would be a "simple solution" to the problem. The judge finally spoke up and decided we should postpone our hearing to another date. I ran out of the courthouse feeling humiliated. I told my supervisor what had happened. She laughed and said "Oh, that sounds like something he would say." I had to continue to see this man for months after this, and had to sit through a trial with him. I left that county a few months after this incident. At the time I felt helpless and embarrassed. After all, the judge thought it was funny and didn't seem to see anything wrong with what he had said. Looking back my 36 year old self can't believe my 23 year old self didn't stand up for herself. I am grateful for the other attorney in the room who stood up for me when I didn't know how. I don't know if I ever told her how much I appreciated her that day. She later went on to become the judge in that county. I hope that I can be a voice for someone else in a time when they need one. Unfortunately, I don't believe I was the first or the last person that man said something like that too. Incidents like mine happen to people daily, men and women. But, speaking up, reporting and saying "that's not okay" is the start of change.